Congratulations, John – both very nice things. I hope the book will be a success (it’s great that Princeton University Press, unlike some other top presses, makes even hardback books available at reasonable prices.) And, I hope the paper gets attention, too. Congratulations Professor Quiggin. 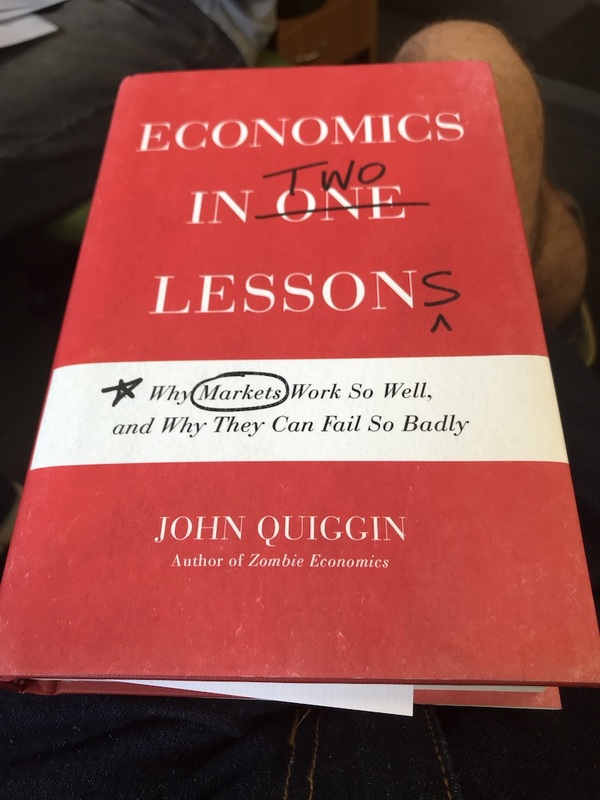 I enjoyed Zombie Economics and look forward to reading your book! This undermines the general presumption that financial deregulation will be beneficial. One would think that the recent real-world experience of the effects of financial deregulation would have put paid to that presumption; or is the ‘presumption’ not ‘financial deregulation is beneficial’ but ‘financial deregulation cannot fail, it can only be failed’? A very good day indeed! Congratulations and enjoy! Would it be possible for you to include a link to Econometrica paper? Even if I can’t understand the arcane maths in the body, I might be able to understand something from the abstract. I like what Princeton UP did w/ the book’s cover. Maybe I’ll even take a look inside. ;) Congrats. Double (?) congratulations, as your website’s banner was featured on Chris Hayes’ show. But seriously, good thesis, good job supporting it. – a dude who has no idea what he’s talking about (or so I would have you believe). @LFC Actually, the cover design was my idea. Almost certainly the only time I will ever get the chance to display my design skills. I’m placing my money on “We’ll get rich, then get bailed out, then use the suffering we inflicted to corrupt the political system to the right”. You could do a lot with this, in terms of intellectual history, but I see it as part of an intellectual illness afflicting large swathes of the ‘Western’ intellectual tradition, what I call ‘neo-Pythagoreanism’: the believe that numbers are essentially mystical entities, occult doorways to the Platonic land of pure, unvarnished, ‘Truth’ (very much with a capital ‘T’). This, which is not in any sense a scientific belief (indeed, it has its origins, ultimately, in Platonic and Pythagorean number worship) has a number of so to speak ‘effects’ in the modern world: the preference for Rationalism (‘capital ‘R’) over ’empiricism’, the preference for quantitative data over qualitative*, the preference (in intellectual circles) for abstract ‘designs’ over the messy, quotidian world of empirical reality, and so on. This is not in any sense to critique the OP: obviously, on enemy territory you have to fight with the enemies’ weapons: if economists won’t actually look at the (disastrous) ‘real world’ history of economic deregulation, and won’t believe there’s a flaw in the idea until it’s ‘proved mathematically’ then…so it goes. And that’s a case well worth making. But the fact that ‘mere’ empirical reality isn’t enough to disprove this theory, that ‘we’ ‘need’ maths to ‘prove’ that there’s a problem…this is a significant (and not value-neutral) assumption. I was very pleased to see this will soon be available as an audio book. I get to spend far more time driving the car than I do reading, sadly. @8 There’s a near-final version here. Not very conversant with the philosophy of mathematics, but it appears that most mathematicians are Platonists. To me it seems pretty obvious that most of the basic notions and operations in mathematics are drawn from experience. Measuring fields for geometry, gambling for probability, tying knots for knot theory, mapmaking for projective geometry, etc. Indeed it seems to me that a necessary understanding of Godel’s theorems is that a purely foundational approach can never succeed. That’s why the old question about the unreasonable effectiveness of mathematics (in physics, chemistry, etc.) The history of mathematics I am familiar suggests very strongly that most progress in mathematics is driven by applied mathematics, that one might even say it is applied mathematics that is the true heart of mathematics. All that so far is a restatement of what you wrote there. The thing is, even if you don’t approach math as a Platonist, even if you are a scientist investigating how things are and how they work rather than a sage divining the Forms of Nature, when you start measuring things, you’re going to start getting arcane mathematics the sooner you get into deep questions. Further, mathematical models are a valid tool in studying reality. The difficulty of course is the same difficulty in all applied mathematics, choosing or devising the best mathematics to generate a model that actually describes how things are and how they work. In other words, arcane maths are very likely to be found in any serious scientific endeavor. If you believe in applied mathematics, demography and geography are mathematical sciences (or should be) and should be foundational to all social sciences. They are not. I have many works of history that managed to avoid ever mentioning population density. I can’t really think this implies a preference for messy empirical reality. Even in the field of economics proper, I am not at all sure that there is a true preference for quantitative data. I don’t think Simon Kuznets was feeling reality by trying to invent national income accounts. I rather suspect that there has actually been very little effort to improving on Kuznets’ work. Left out the end of a sentence, sorry. It was meant to be something like this: The old question about the unreasonable effectiveness of mathematics is unreasonable because the basic ideas in mathematics are ultimately (however far removed) drawn from the world. That’s why they can apply. One of the most notorious examples of arcane mathematics was Marx’s reproduction schema. I do not think he was trying to escape reality by hiding in numbers. Congrats! I also like the cover, well done. Congratulations on the publication of your book! I look forward to reading the reviews by admirers of Henry Hazlitt, and, more importantly, the debate that should occur. John Quiggin@24 Thank you for the link, which seems to confirm that national accounts have not been much improved. And thanks for the information on Clark. A Nobel, even one for economics, still invests a certain appearance of significance. I will not blame Clark for the failings of national accounts any more than I did Kuznets. Kuznets and Clark are important pioneers. But the present structure of National Accounts, as developed during and after WWII by Stone, Meade, and Gilbert with Keynes’ influence, bypassed both Kuznets and Clark. Whether that was an improvement or not depends on your point of view.